The opening round here is an ABBI Classic competition for 3- and 4-year-old bulls. It’s the first of the season at this level, so there will be many inexperienced bulls here. However, there will also be a few who may be stronger than the bulls in the 15/15 round later tonight. This is possibly the most talented rookie rider against the most talented rookie bull. Hocus Pocus showed up to the World Finals as an unknown 3-year-old and walked out as the highest marked bull of the finals, earning the ABBI Classic title in the process. He earned over $275,000 in ABBI competition last year and he’s among the favorites to win it again this year. He should go into Craven’s hand here. Mauney may be banged up, but he has a near-perfect draw here. Little Tucker should go into his hand, and he’s one of the nicest draws in the first round for a left-handed rider. He was 0-2 at the World Finals – his first UTB-level event. Cody Nance and Matt Triplett both rode him, and Triplett won a round on him. Nance has a decent shot here. Uncle Gangster can drift and step forward in the spin, and he’s not easy, but he’s 2-2 when he’s faced the top tier riders. This bull has only two outs on record, but one of those was an 88-point ride by Luis Blanco in the Velocity Finals in November. Lockwood should have the advantage here. This could easily be the round win. Audacious was the 2017 ABBI Futurity Champ as a 2-year-old, and he will probably spin into Outlaws hand here. This is a classy-looking bull, and Outlaw will make him look good. Concealed Carry is one of the more experienced bulls in this round, and he may be the best overall draw. He has great timing and does everything well. He’s strong but honest and rideable. Richardson isn’t the strongest rider here, but this bull – like Bruiser – kind of fits everyone. Piva is making his UTB debut here. This is nothing new for Mind Freak. He has plenty of experience at this level, but he has no experience with losing. He’s beaten all 28 riders who have tried him, including some of the best riders in the world. He’s a pretty tough challenge for any rider’s first day at this level. Claudio Montanha rode this bull at the World Finals, and Eduardo Aparecido rode him at Springfield before that. He bucked Cody Jesus off in New York. This is a tricky bull. He’s very fast and very intense. He can move away from the rider and be welly, and he likes to go to the left, but whatever he does there is little margin for error on Nance’s part. Eldred broke Frequent Flyer’s long unridden streak a couple of weeks ago in Glendale. He’s facing pretty much the same situation here. Old Fort Days is 22-0 in his career, and in some ways he’s more difficult than Frequent Flyer, but he goes to the right, and Eduardo Aparecido nearly rode him recently in Chicago. Eldred was the last man to try this bull at the 2017 NFR just before K Bar C bought Old Fort Days and started bringing him to PBR events. Bottoms Up is one of the prime draws in this round, but more so for left-handed riders. He’s 10-10 against lefties, but 11-1 against righties. Cravens has a chance here but he will have to deal with this bull going away from his hand. Jesus bucked off this bull in Albuquerque last year, but in general, Cochise is a great draw for left-handed riders. He can be hard to deal with right out of the chute and he can cover a lot of ground in his first couple of jumps, but once he goes into a spin he is much easier. This may be one of the more promising matchups in the round. We’ve seen enough of Castro to know he has a particular type of bull, and Lester Gillis is that type. They met at the World Finals and sure enough, Castro won the match. Any bull that goes wide open to the left from the word “go” is a perfect fit for Castro, and that is likely to happen here. Big advantage to the bull here. Canadian Mist is a veteran bull at the peak of his performance who goes to the left, while Sobrinho is a newbie at this level and is right-handed. Souza has a shot here because he’s right handed, but not much of one. Cooper Davis rode this bull last fall in Atlantic City, and Smooth Operator’s difficulty was apparent in that ride. It was all Davis could do to get to the whistle, and although it wasn’t the highest-scoring ride in PBR history, most insiders consider it the most impressive one. If Souza does his part perfectly, this will still be a really hard bull to ride. Medicine Man is the softest draw in this round for a right-handed rider. He’s 4-5 against them. It doesn’t help that the right-handed riders he’s faced have been some of the world’s best. He’s a solid bull and Divino won’t be able to sleepwalk through this, but Medicine Man has the lowest difficulty grade in this round. This bull is a lot like Air Assault – the bull Alves was 89 points on in the Sacramento short round last week. He can be quick, stays close to the ground and can scoot forward. Air Assault may be the more difficult bull to ride of the two. Gangster likes to go to the right, and he’s weakest against right-handed riders. Alves was 90 points in one of the long rounds last week, but his short round ride really said something. There’s no way he rides that bull without having his mental game right, because Air Assault gave him plenty of chances to get off. At the peak of his career, it took a very rank bull on his best day to get Alves on the ground, and you could never safely bet against him. We saw a glimpse of that guy in Sacramento. Look for the bull to have the edge here, but Barbosa could make this interesting. Smooth Wreck is a really strong bull with a lot of up and down action, and he tries hard. Barbosa is a strong rider, but he has flawed mechanics. He often makes too big a move, especially with his free arm, and he relies on luck, balance and talent to overcome this. His best rides are an exercise in controlled chaos. This particular bull isn’t a great fit for that style, and this match is likely to end in a spectacular or even scary buckoff. If Barbosa can beat the odds, he will make the bull look even stronger than he is and should net well over 90 points. Outlaw’s riding percentage has fallen back to mortal levels but he has a chance at a qualified ride here. Night Sweats should spin into Outlaw’s hand, but he’s far from a straightforward spinner. He can be really fast and will drift across the arena with a lot of shifty moves. He’s a challenge for any rider. Leme rode this bull for almost six seconds at the World Finals. Frequent Flyer gave up his first ever qualified ride to Brennon Eldred two weeks ago, but that doesn’t mean he’s any easier than he’s ever been. Leme does well against this style of bull, but this is a big job for him. Frequent Flyer isn’t a great fit for any kind of rider. This bull can have some hesitation, uneven timing, and he can be welly. But he does all this while going to the left. Vieira is on a roll at the moment, and throughout his career he’s been extremely good on bulls that go to the left. If you watched Sacramento last week, two of the strongest and most difficult bulls in the short round were Fearless and Heartbreak kid. Lockwood chose Heartbreak Kid and nearly rode him. This bull is very similar, and Cody Jesus nearly rode him in the same short round. The odds are against every rider on this bull, but look for Lockwood to put up a real fight. 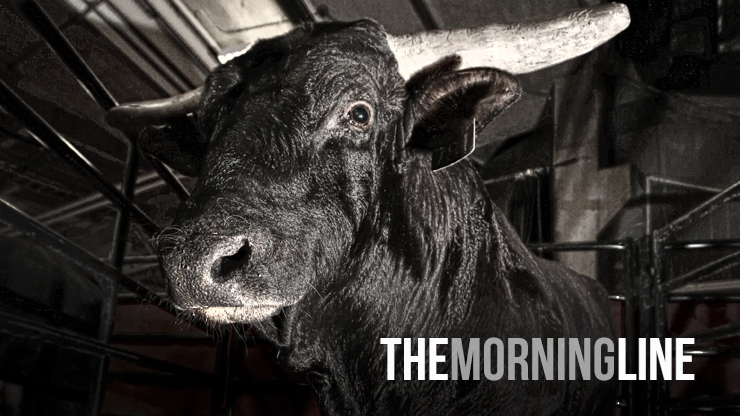 He almost pulled off a 93- to 95- point ride against an equally difficult bull a week ago.